I just recently got back to El Paso and found that the weather ain't the only thing getting hot. There is a crazy Sheriff named Leo Samaniego who is running around acting like someone promoted him to the position of Chief of the El Paso Sector of the Border Patrol (ie, local sheriff is enforcing federal immigration law and scaring the community). In addition to Leo the Lion out looking for people's papers, President Bush calls for 6,000 troops to come down to the border. 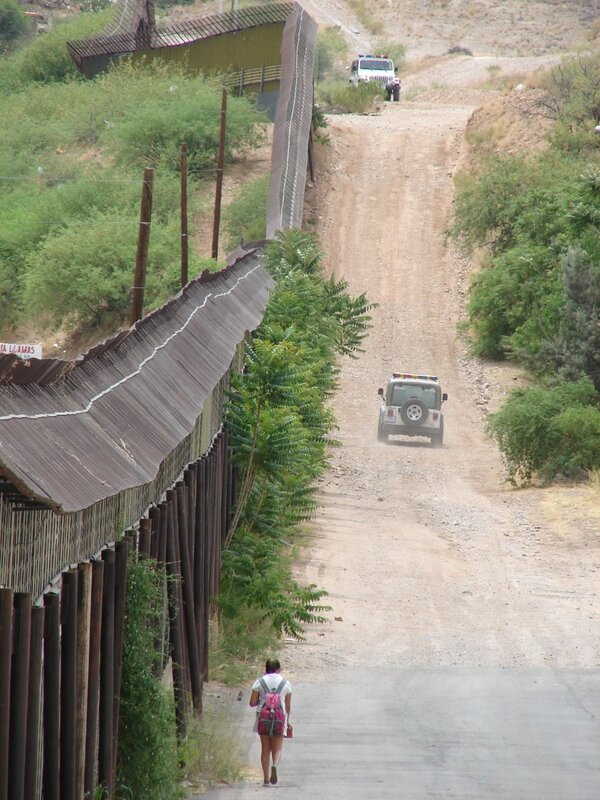 Thousands of more troops will not keep people from crossing the border, but it will make it more difficult. People will be forced to cross in even more remote areas and even more will die. The picture on the right was taken on the U.S. side of the fence in Nogales, AZ. I think the pictures shows the strategy of militarization pretty well. You see the huge fence and two agents just down the way. This is in the middle of the city and if you keep driving down the road you'll eventually be in the middle of the desert where the large fence shrinks considerably and you are less likely to see Border Patrol. In other words it is a signal to migrants to not cross in the city area, but to go out into the desert and risk their life. I think the picture also shows another aspect of militarization that is often overlooked. There is a young girl walking down the fence with her backpack, presumably just come from school (though if you ask the Minutemen she's probably carrying drugs). I didn't talk to the young woman, but I wonder what the psychological impact of that huge fence, seeing large towers mounted with cameras, and having to walk by armed federal agents everyday must do to her. When I was her age I think the fence in Douglas was still just a small chain-link fence with holes everywhere and the chance of seeing a border patrol was pretty slim. No, I didn't have to walk up hill both to and from school, what I am saying is that it was easier for me back in the days. I took the picture while showing some friends of mine around Nogales. 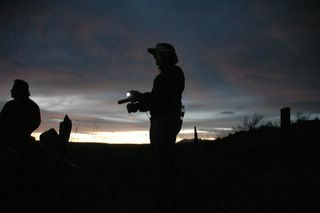 We are working on a paper and we were returning from a focus group we conducted at the Migrant Center in Altar, Sonora. It was a great trip and we did 5 focus group in 4 days, in 4 cities, 3 states, and 2 different countries (Ciudad Juarez, El Paso, Agua Prieta, y Altar). It was quite refreshing to go from a long-month out in the middle of the desert to sitting calmly and talking to migrants about their journeys and their thoughts about politics and the U.S. society. There is a lot of scholarship on the issue of migration and every day more newspaper articles, but they all seem to be missing a key component, the thoughts of migrants. This is not to say that migrant voices are absent, I think in most mainstream media there is a quick soundbite that paints the migrant as victim and has them telling why they are coming across and how difficult it is. At least these are what the 'good' articles try to do. I think the liberal coroporate media pretty much looks for this soundbite from a migrant, "I just want to come to work to support my family because things in (insert country in Latin America) are difficult." With the mass demonstrations I think migrants finally forced people to hear a little bit more, statements such as, "I am not a criminal" and "I pay taxes that support this economy." I was thankful to be able to listen to many people very eloquently say so much more and look forward to the thoughts, opinions, and world-views of migrants coming more to the forefront.